If you or someone you know has been diagnosed with dyslexia, you know it can be a frustrating disability. One of the few local options for families struggling with dyslexia is a center in Peoria, which was recently forced to close its doors. But workers say they’re not giving up without a fight. From early on, proud mother Lisa Gentry could tell her son Robert was a gifted child. “This little boy, even at four years old, had this wonderful vocabulary and could carry on conversations,” said Gentry. So when Robert began struggling to comprehend reading assignments in school and was eventually diagnosed with dyslexia, it was disheartening. The Children’s Dyslexia Center of Peoria closed as of Monday (August 31, 2015), but a small group of educators, advocates and volunteers is working to ensure it will reopen. The center was notified a year ago by its funding organization, the Scottish Rite Foundation, that money had run out for the tutoring program offered to children struggling with reading-related learning disabilities. Since then, the Peoria Tazewell Dyslexia Awareness Network has been working to take over operations. Normally, tutoring services would resume after the Labor Day holiday, but PTDAN is hoping to welcome students in mid-September under the new name, Dyslexia Awareness Network. The tutoring structure will remain the same, Carroll said, 45 to 50-minute sessions, twice per week — but at least one major change will be made to the center’s operations. Tutoring used to be offered for free, but now it will cost a family $4,000 per year. Eventually, she said, PTDAN hopes to offer scholarships, depending on the amount of money in the organization’s fund. She hopes the organization will obtain some grant money as well. 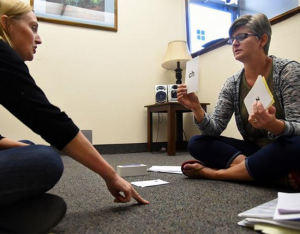 Lori Dickinson of Germantown Hills and Cyndie Kersh of Dunlap practice teaching a lesson during a training session for tutors Saturday at the B&B Counseling Services building in Peoria. Both will earn certificates in the spring.